The story travels back to the time after Sasuke's defection from the Leaf and before Naruto's return from his two-year training journey with Jiraiya. Episode 395 - The Chunin Exams Begin! The Hidden Leaf begin preparing for the Chunin Exams. 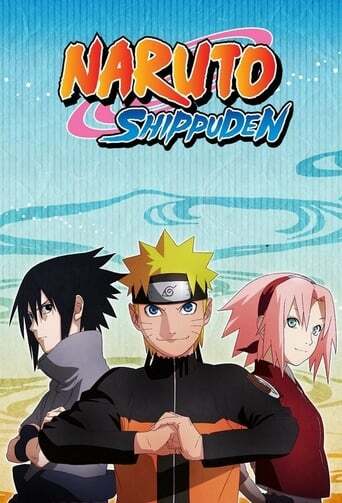 Ino and Choji ask Sakura to join their three-man team as a stand-in for Shikamaru, who is already a chunin. The Chunin Exams finally begin and the proctor for Round One is none other than Shikamaru! The genin are unable to figure out the answer and start to panic. On the night before the Second Exam, the entrants gather in the cafeteria, and a brawl breaks out. The Second Exam finally begins! To pass this stage, each team must take possession of both the Heaven and Earth scrolls and make it to the designated site in the center of the Demon Desert within 72 hours. Noting the similarities of their circumstances, Lee is outraged at the ones who hurt and belittled Shira and sets out in pursuit! Ino, Sakura and Choji trudge across a desert under the blazing sun without any provisions. Ino and Sakura are arguing when a giant scorpion attacks and injures Sakura. As Ino and her team head toward an oasis, they are attacked by a team of Sand Shinobi comprised of Ameno, Shishio, and Kouji. Sakura and her team continue their trek across the desert towards the goal. Their continuous battles have depleted Sakura's chakra, so they stop to rest. Just then, they encounter a puppet manipulated by a rival team from the Sand and end up being discovered. Ino and Choji fight to protect an immobilized Sakura although they have depleted most of their chakra due to the relentless fighting. Sand Jonin Fugi sneaks into the Demon Desert and creates a massive sandstorm in order to assassinate Gaara, the Fifth Kazekage. Gaara heads out to rescue Matsuri and the others but is attacked by a mysterious priest who binds him with a Chakra Chain to capture his Tailed Beast. Neji and the team come across Matsuri collapsed in the desert and find out that Gaara is in danger. Meanwhile, the chains of a mysterious priest bind Gaara and Foo. Gaara meets with Fugi, the mastermind behind the assassination attempt on his life. He confides that perhaps, after all the fear and pain he has wrought upon the Sand, he has no right to be their leader.